Writers: Do not do a Peter Nabokov! Please respect tribal nations and our protocols. In several places, I've written about the 1800s, when white ethnographers began going to reservations--uninvited--with the intent of documenting our stories. Those ethnographers were outsiders. Did they understand what they were writing about? Were their informants reliable? There are a lot of questions about those archived stories, and yet, present day storytellers use them to "retell" Native stories that get presented to children in classrooms as authentic. Some of those stories are ones tribes want to protect from outsiders. To protect their stories, Native Nations developed protocols that researchers--and that means writers, too--are expected to use. You’re a white man yourself. How did the Acoma tribe regard this project? They didn’t know about it. [Laughs] There was some concern about the republication of the Acoma’s Origin Myth. When it was published in 1942 by the Bureau of American Ethnology, it sat under-appreciated for a number of years. Later on, it appeared in excerpted form in anthologies. With the coming of the Internet, various people put it out in the public domain, including the pictures, the kachina masks, the maps and depictions of sacred altars. I thought this publication of the Origin Myth deserved a second, more dignified shot. So I didn’t allow any pictures of the sacred altars or kachina masks to be republished, just the text. I feel this story deserves inclusion alongside the Bible, the Koran, and all the other great texts of world literature. See that? He knows there are concerns but he laughed that Acoma didn't know he was publishing the book. He tells us he wanted to be "more dignified." What he chose not to include in his book suggests that he is more dignified in his treatment. That he wants the story to be alongside other texts of world literature suggests that he is aware and sensitive to the place of Native story in a global context. Sounds good, but is it? The short answer is no. Nabokov agreed to submit the manuscript to the pueblo for review and to appear before the Acoma Tribal Council to discuss possible publication of the book. Virtually every other modern scholar and professional working with the Pueblo of Acoma has sought this permission when seeking to disclose sensitive cultural information. Contrary to popular misconceptions, Acoma has approved of disclosure in the past. Some examples of published work with permission of the Pueblo of Acoma include publications by Dr. Ward Allan Minge, Dr. Alfred Dittert, Dr. Florence Hawley Ellis, Dr. Kurt Anschuetz and others. While a manuscript of The Origin Myth of Acoma Pueblo was submitted to Acoma Pueblo at the pueblo’s insistence upon discovering Nabokov’s planned publication, and was being reviewed by traditional leaders, Nabokov did not follow through on any of his other promises prior to publication. Nabokov holds himself out as a scholar and “friend” of Indian tribes. His actions suggest otherwise, as he does not exhibit basic respect for tribal beliefs and practices. I think it is fair to say that Nabokov is exploiting Native people for personal gain. There's no integrity in what he did, none at all. And his treatment of Acoma's wishes gives me pause. What, I wonder, about the rest of his books? Are you planning to use a Native story in a work of fiction or non-fiction? Find out if it is ok to use it. 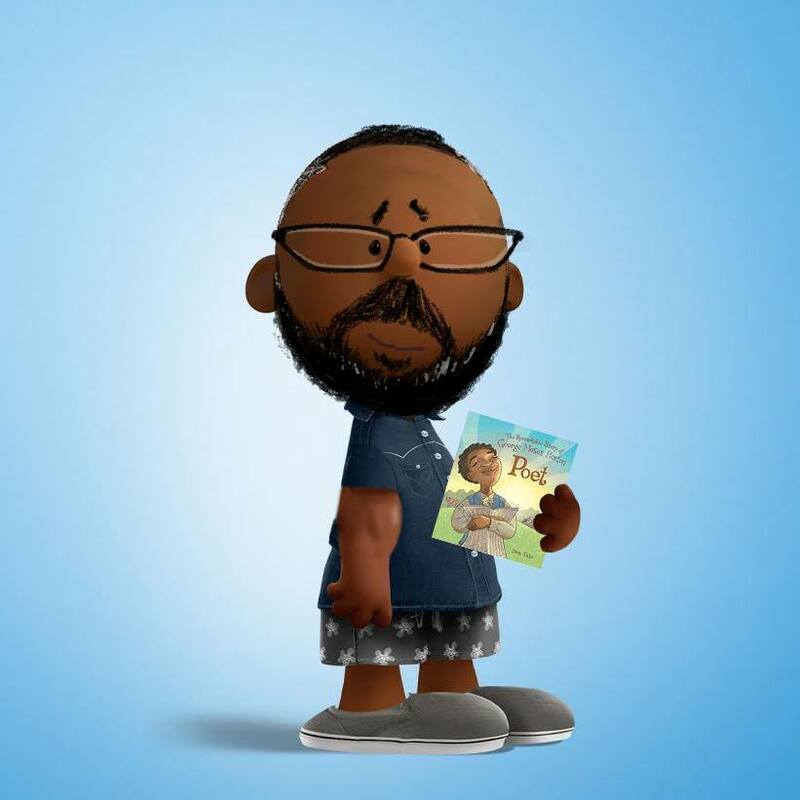 Do not assume--as the author of a recent children's book did--that those protocols only apply to academic researchers. They apply to anyone. Don't assume a visit to a tribe's museum and a chat with a docent counts as authorization. It doesn't. Don't assume your friendships with people of that tribe are sufficient. They aren't. Do it right. Respect the wishes of the tribal nation from whom the story originates. Not doing so could mean you'll be written up in the news, exposed as someone with no basic respect for tribal peoples and on AICL, too. 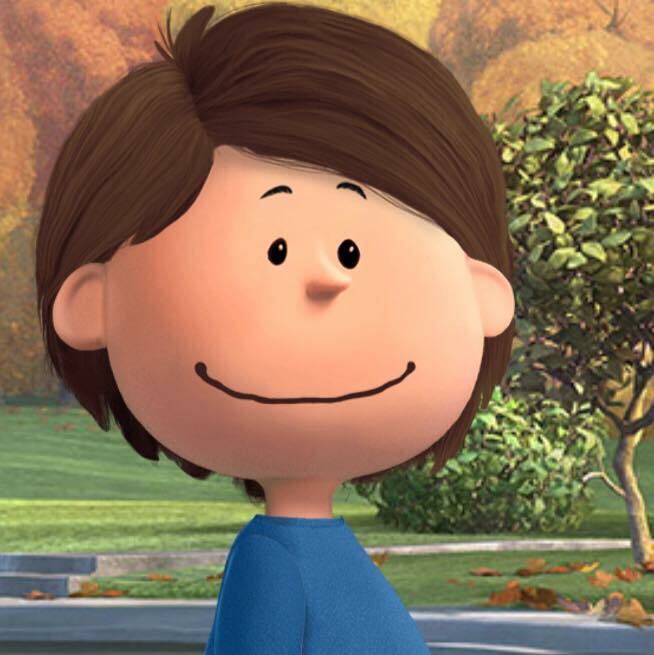 Have you seen the Peanutize Me avatars people are creating? 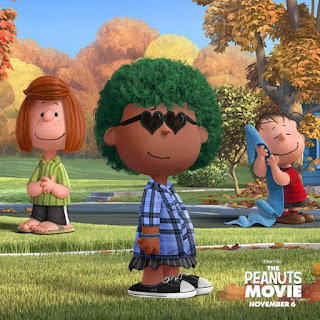 It is a clever promotion for the Peanuts movie due out in November. "I am the invisible brown." 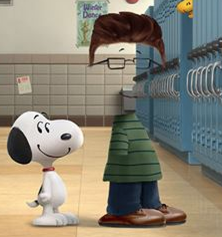 "Quit smiling, Snoopy. We have work to do. Crappy books about us keep getting published." 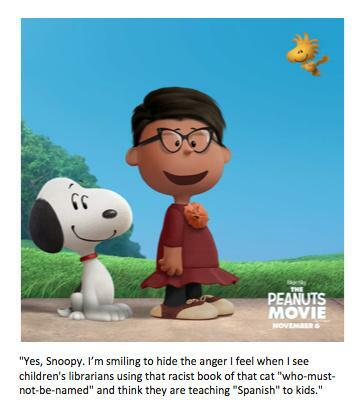 If you create one with a political message about children's or young adult literature, let me know and I'll add it. but male chars wearing kilts & skirt-like apparel." Delighted to add artist Don Tate (Wednesday, September 23rd, 2015) who used his artistic skills to great effect! 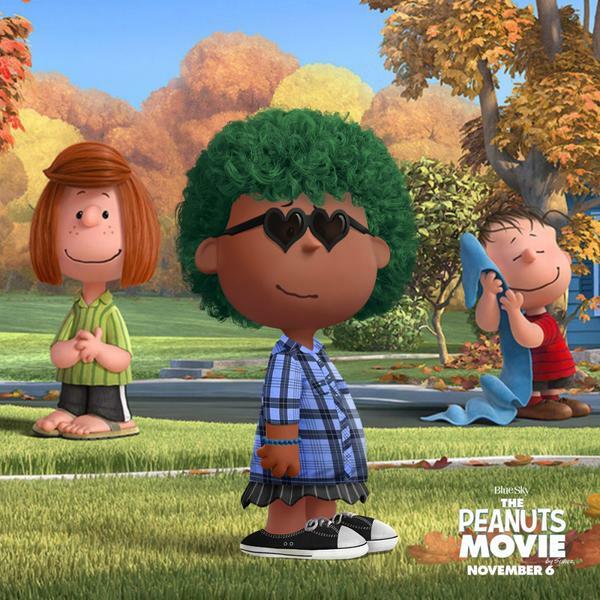 "#We Need More Diverse Peanuts"
came to the realization that we ALL need diverse books." *In later conversations with Rene, he told me that he was surprised when he downloaded his avatar and saw that he was invisible. In the part where you select skin tone, he had selected a light brown. We both wonder if invisible was an option, and why his avatar turned out invisible. I thought it was deliberate on his part. It echoed the invisible nature of books by Latino writers, and, reminded me of an essay he wrote at Latinos in Kidlit, Forgive Me My Bluntness: I'm a Writer of Color and I'm Right Here In Front of You: I'm the One Sitting Alone at the Table. A mysterious old woman invites a stranded family to sit on her porch while they wait for their car to be pulled out of a gulley. She weaves them a fascinating tale of a young indigenous couple, Rose and Charlie, from rural Texas during the depression, who run away to Illinois with their new born baby Cinnamon. Rose and Charlie are shocked to learn that the farmer they worked for bequeathed them all his money and a Model-T Ford after he and the whole town are destroyed by a ferocious tornado. They decide to return to Texas, only to be immersed in the battle between the Bat People and the Crow People…and the evil of a conniving witch, who has bad intentions for Cinnamon. Cinnamon is a "Native American" but important information is missing. What tribal nation does she belong to? We aren't told. Instead, the Native content is stereotypical in both, romantic and derogatory ways. "Did you say a little Indian girl?" Dan said with a raised eyebrow, looking relieved the crows were gone. "Do you mean Native American Indian?" "Don't interrupt!" I said, scrunching my face. "Back then, we just called them Indians, and no one paid no mind." Who is "no one" in the old woman's mind? In the promotional materials for the book, it is clear that the author has a reverence for stories about Native peoples that she was told as a child, but much of what I read in the book--like that passage--is unsettling or just plain odd. In short, I do not recommend Cinnamon and the Bat People. A few weeks ago, I was at Georgia State's College of Education to talk with professors and students about Native peoples, how we're taught in the curriculum, choosing children's books, etc. A few days ago, a student wrote to me with a question about biased content and how a teacher could address it. 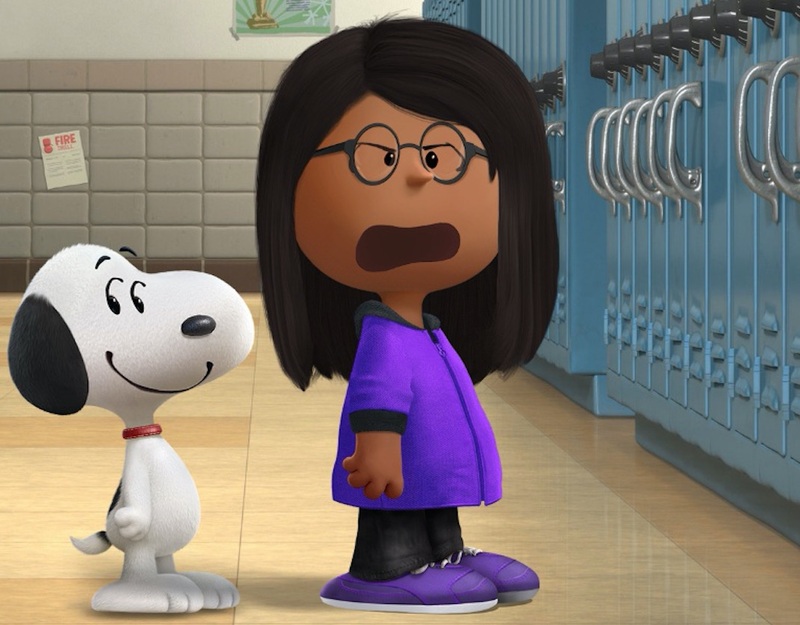 She had a specific example in which she imagined a fourth grade class being taught about specific Native Nations. She imagined a student asking the teacher why Native Americans were moved to reservations. She wondered how the teacher might respond in an unbiased manner. Let's look, first, at the word "bias." It means prejudice in favor or against a thing, person, or group, compared with another, in a way that is unfair or partial to one of the groups. Mr. Martini is standing under the buffalo carving, which is my favorite of all the carvings on the lobby wall that depict the history of Greenwood, although Daddy says there would not have been buffalo east of the Mississippi River, which is where the Delta is. There would have been Indians, though--the Choctaw and Chickasaw including Choctaw Chief Greenwood Leflore, who was here first and signed the Treaty of Dancing Rabbit Creek way before the Civil War. That's when most of the Indians moved to Oklahoma. Miss Coffee, my fourth-grade teacher, would be proud of me for remembering. I want to focus on two passages from that paragraph. First is the idea that Indians were "here first." It may seem innocent enough, but scholars in Native Studies see language that says Native peoples were here "first" as a way to undermine our sovereignty. If we were simply here first, followed by __ and then by __, one can say that everyone--Native peoples, too--are immigrants to this continent. Second is "the Indians moved to Oklahoma." Written as such, it sounds like they--on their own--decided to move. Of course, they had not chosen to move. They were forcibly removed. Although Miss Coffee told Sunny about the Dancing Rabbit Treaty, I wonder if her bias in favor of White landowners and against Choctaws is evident by Sunny's takeaway: that Indians "moved" to Oklahoma. If Wiles had, in the backstory for this part of the book, a character who is Choctaw, that character could have corrected Miss Coffee. That paragraph I quoted above could then end with Sunny saying "but Joey, who is Choctaw, told Miss Coffee that his people didn't move. They were REmoved." A plus in that paragraph is this: Sunny says "most" of the Indians moved. In that "most" she is correct. The descendants of Choctaws who refused to be removed were federally recognized as the Mississippi Band of Choctaw Indians in 1945. And, Sunny's dad is wrong about buffaloes. They were, in fact, east of the Mississippi. Were they in the Delta? I don't know. Let's return to the question posed by the Georgia State student. Let's say that the curriculum the teacher is using has the words "moved" in it and let's assume the teacher knows that the Choctaw's were forcibly removed. She could teach her students about bias right then and there, using moved/removed as an example of bias and she could provide students with information from the Choctaw Nation's website. It has a detailed account of removal. A teacher using Wiles's book could pause the reading on page 263 to correct what Sunny learned from Miss Coffee. The point is that teachers can address bias in materials. This is, of course, teaching children to read critically--and reading critically is a vital skill. Thanks, student at Georgia State, for your follow up questions! I hope this is helpful.